Timely submission of your proposal to a sponsor depends on your providing complete and accurate information as well as meeting giving sufficient time for internal review. OGCA must frequently review and submit many different proposals for the same deadline. Consequently, heavy proposal volume may preclude on-time submission of any proposal that arrives late. Unit proposal coordinators will need time to help prepare proposals for review and approval from OGCA before submission to the sponsor. The following information can help everyone plan for a successful submission. OGCA will always make every effort to submit a proposal in coordination with the unit and the PI. In an effort to support collaborations and simplify unit workflow, OGCA reviews proposals piece-by-piece as the final elements become available for final review and endorsement. This is done in the event that a unit is unable to provide a complete and final submission package at the time final review and endorsement. This provides the unit and PI the flexibility to continue to work on the remaining pieces without delaying final review. When submitting via electronic systems such as Grants.gov, NSF FastLane, NASA NSPIRES, etc., the system marks certain issues with warnings and errors. Even if the items are not errors, it could prevent the proposal from being validated. With the proper time allowed, it is possible to give units the option and time to review and correct any items that the system marks as warnings. OGCA will then submit the proposal. This level of service is only available for proposals that arrive at OGCA with the full, five-day review window. What if the unit is submitting the proposal to the Sponsor? The same guidance applies regardless of whether OGCA or the unit will submit the proposal to the sponsor. What if the sponsor deadline is 11:59 pm EST? That means we have until 7:59 pm Alaska time. OGCA operates during normal UAF business hours of 8 am-5 pm. 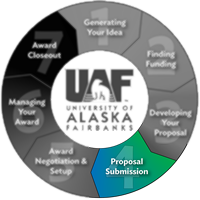 Therefore, proposals must be received by OGCA in time to submit the proposal by 5 pm Alaska time on the deadline date, even when the sponsor deadline is in a different time zone or is later than 5 pm. Sponsors often consider the local applicant institution time as the deadline, even if they are in a different time zone. Please contact our office if there are extraordinary circumstances. If mine is due first but comes in later, how will you review? For electronic submissions: Proposals will usually be reviewed and submitted in the order in which they are received, subject to major deadlines that may shift the priority. Note that problems beyond OGCA control, such as corrupted files or Internet interruptions may result in proposals not being submitted in a timely fashion. OGCA staff will do everything possible to get the proposal to the sponsor on time. However, as the amount of time for processing is reduced, so the chance for insurmountable obstacles increases. Certain parts of the review process are subject to the schedules of other offices. When there is sufficient lead time, OGCA staff can compensate for these problems. Therefore, faculty and unit coordinators should make every effort to provide the maximum time possible for OGCA to process and adequately review their proposals. OGCA has a shared proposal Google calendar that is used for units to share upcoming proposals and manage anticipated workload. Note that this calendar is not a substitute for notifying OGCA about a new proposal for review, nor its deadline. ​*The technical scope of work can be a draft, but should be finalized at least 3 full business days in advance of the sponsor’s deadline. Complete and final proposals received less than 5 full business days in advance of the sponsor’s deadline will be reviewed on a deadline priority basis, subject to proposals already received and other existing commitments. While UAF policy does contain the caveat that there is no guarantee for submission, OGCA will always make every effort to submit the proposal in coordination with the unit and the PI. The complete and final technical proposal should be ready to submit to the sponsor and received by your institutional representative in OGCA or released in the relevant sponsor portal (e.g. FastLane, Grants.gov, NSPIRES, etc.). OGCA will always make every effort to submit the proposal in coordination with the unit and the PI. Complete and final proposals received with less than 2 full business days in advance of the sponsor’s deadline increases the chances that the proposal will not be adequately reviewed before the sponsor deadline. OGCA will always make every effort to submit the proposal in coordination with the unit and the PI. It is critically important that once you submit your proposal to OGCA that you or your staff are readily available to respond to questions and to make any necessary proposal fixes necessary for OGCA to submit the proposal. In fairness to PIs and project teams who meet the 5-business day review window, even when the volume is large, proposals received on time will be fully processed, including necessary re-submissions, before those proposals that arrive at OGCA outside of this window. OGCA will always make every effort to submit the proposal in coordination with the unit and the PI.